NASA’s Frontier Fields program has reached a critical point. The observations by NASA’s Great Observatories (Hubble, Spitzer, and Chandra) are nearing completion, and the full data are nearly all online for astronomers (or anybody else for that matter) to study. 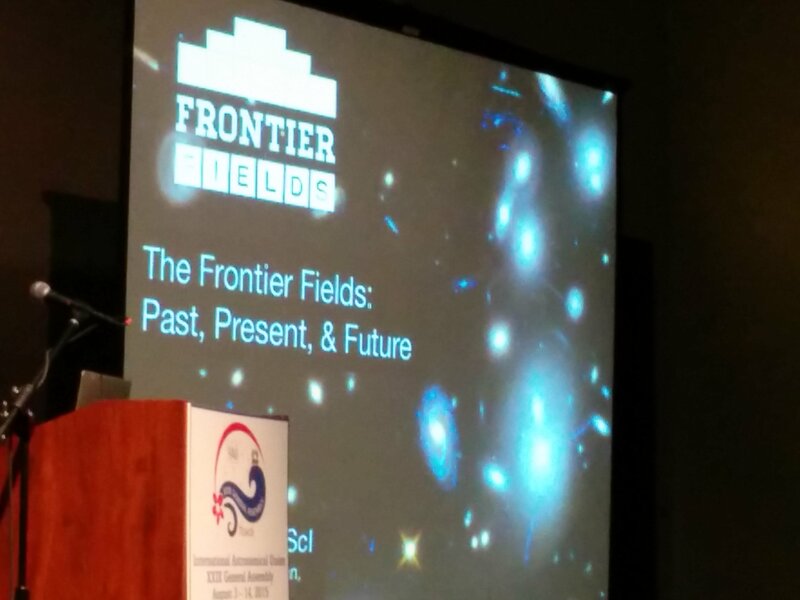 To herald this part of the program, the Frontier Fields were highlighted at the January American Astronomical Society (AAS) meeting in Grapevine, Texas, where over 2,500 astronomers gathered to discuss the cosmos. A new exhibit was displayed to help tell the story of the Frontier Fields program to the science community. We share that story with you below. 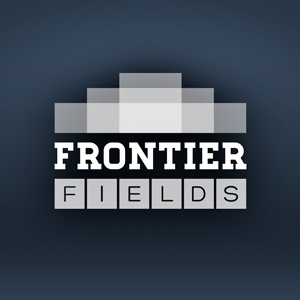 The Frontier Fields is a program developed collaboratively by the astronomical community. Despite the fact that observations are coming to an end, the wealth of data being added to NASA archives will ensure new discoveries for years to come. A Sneak Peek at the First Billion Years of the Universe: Galaxy cluster fields extend the reach of the Great Observatories by allowing astronomers to use a technique called gravitational lensing, which magnifies background galaxies that are otherwise presently unobservable. Chandra, Hubble, and Spitzer are building upon more than two decades of deep-field initiatives with 12 new deep fields (six galaxy cluster deep fields and six deep fields adjacent to the galaxy cluster fields). By using Hubble, Spitzer, and Chandra to study these deep fields in different wavelengths of light, astronomers can learn a great deal about the physics of galaxy clusters, galaxy evolution, and other phenomena related to deep-field studies. Observations with Hubble provide detailed information on galaxy structure and can detect some of the faintest, most distant galaxies ever observed via gravitational lensing. Spitzer observations help astronomers characterize the galaxies in the image, providing details on star formation and mass, for example. High-energy Chandra X-ray images probe the histories of the giant galaxy clusters by locating regions of gas heated by the collisions of smaller galaxy sub-clusters. An example of images taken by Hubble, Spitzer, and Chandra of the Frontier Fields galaxy cluster Abell 2744 are shown below. These images show how astronomers can use color to highlight the type of light observed by each of NASA’s Great Observatories. By discovering background galaxies that are obviously multiply lensed, and measuring their distances, astronomers can use Einstein’s theory of general relativity to map out the distribution of mass (normal matter plus dark matter) for the galaxy cluster. Once this mass distribution is known, astronomers can go back and look at regions where they expect the largest magnification of distant galaxies, again due to Einstein’s theory of general relativity. From these calculations, astronomers can develop magnification maps that highlight the regions where Hubble is most likely able to observe the most distant galaxies. This technique has allowed astronomers to detect ever-more distant galaxies in these fields and has helped astronomers better refine their models of mass distributions. In the first few years of the program, over 85 refereed publications and 4 conferences have been devoted to or based, in part, on the Frontier Fields, including a workshop at Yale in 2014 and a meeting in Hawaii in 2015. Three types of science results are highlighted below. Frontier Fields observations by NASA’s Great Observatories, along with additional ground-based observations, are building our understanding of the physics of massive galaxy-cluster mergers. 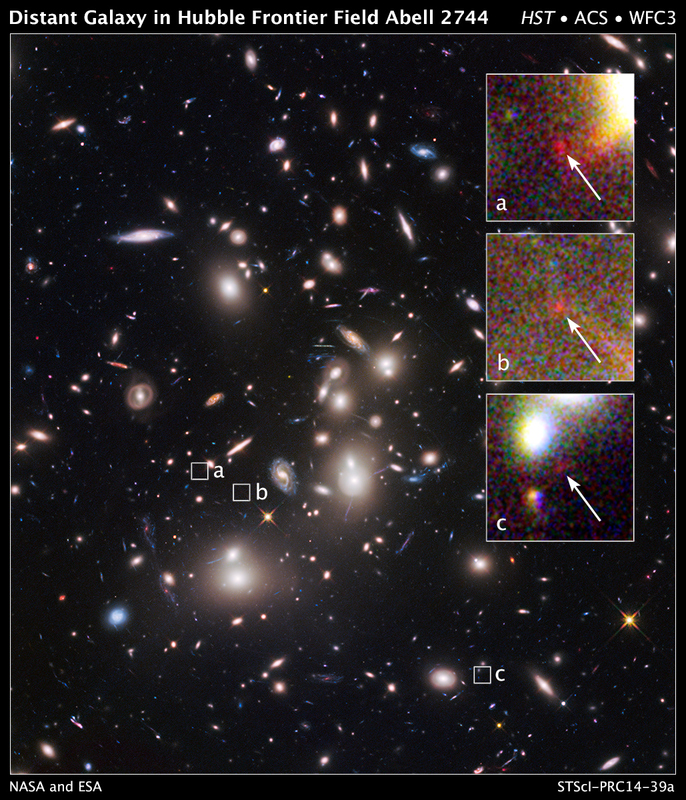 By studying Hubble Space Telescope deep imaging at the locations where gravitational lensing magnifications are predicted to be high, astronomers are detecting galaxies that are up to 100 times fainter* than those observed in the famous Hubble Ultra Deep Field. Infrared observations by the Spitzer Space Telescope enable astronomers to better understand the masses, and other characteristics, of background lensed galaxies and those residing within a massive galaxy cluster. *Author note: this has been updated from 10 times fainter than the Hubble Ultra Deep Field to 100 times fainter than the Hubble Ultra Deep Field due to recent published results you can find, here. In 2014, a multiply lensed supernova was discovered, providing a key test of the models of gravitational lensing. As predicted by the models, a new lensed version of the supernova appeared in 2015. Learn more about the appearance of a new lensed version of Refsdal here. Both the James Webb Space Telescope (JWST, scheduled to launch in late 2018) and the Wide Field Infrared Survey Telescope (WFIRST, scheduled to launch in the mid-2020s) will greatly expand our understanding of galaxies and the distant universe. JWST will build upon the success of Spitzer’s observations of the infrared universe with enhanced clarity and sensitivity, probing deeper into the universe than ever before. Due to the expansion of the universe, light from the most distant galaxies are shifted to redder wavelengths, moving beyond the visible spectrum and into infrared light. One of JWST’s primary science goals is to observe these infant galaxies at the edge of the observable universe. Imagine having a Hubble-class telescope that can observe in the infrared and see greater than an order of magnitude more of the sky with each observation. WFIRST’s expansive field-of-view – 100 times wider than Hubble’s – will allow for new ground-breaking surveys of the deep universe. There is no denying that the history we tell about science is full of achievements often credited to individual efforts. The reality, of course, is that scientific achievements are not done alone or in intellectual vacuums. Astronomer Edwin Hubble, for example, built upon the ideas of other astronomers when he made his landmark discovery in 1923 that the faint spiral nebulae observed in the sky were actually other galaxies outside our Milky Way. This surprising finding greatly expanded our understanding of the size of the universe. Before Hubble’s discovery, scientists were embroiled in a fierce debate about the nature of these nebulae. Some, most prominently astronomer Harlow Shapley, believed that these nebulae were parts of our own Milky Way galaxy. Others, like Heber Curtis, posited that the Milky Way galaxy was smaller than suggested by Harlow Shapley, and these nebulae were likely entire galaxies outside of the Milky Way. This scientific disagreement was brought to the fore during a public debate between Curtis and Shapley in 1920. It was not until 1923 when Edwin Hubble observed a cepheid variable star in one such nebulae that the debate was quickly settled. Hubble determined that the cepheid variable he was observing was very far away – much too far away to be a part of the Milky Way galaxy. In fact, he had discovered the variable star resided in what we now know to be our neighboring Andromeda galaxy. This put to rest the debate vociferously argued by Shapley and Curtis. Cepheid variable stars are stars whose intrinsic brightnesses change with time by a known amount. This makes them great “standard candles” to calculate their distances. If you know you are observing a 60-watt light bulb, you can calculate the distance to the light bulb based on the amount of light you observe – the fainter the 60-watt light bulb appears, the farther away it is. The key to Hubble’s discovery was the knowledge that we could determine a cepheid variable’s intrinsic brightness based off of its observed periodicity, which is the amount of time the variable star takes to go from maximum brightness to minimum brightness and back to maximum brightness. Hubble could not make his discovery without this background information, which, as it turns out, was first published in 1912 by astronomer Henrietta Swan Leavitt. Henrietta was not given proper credit for this monumental discovery at the time, but there is now no doubt that her efforts paved the way for our modern understanding of stars and distances in the cosmos. Picture of astronomer Henrietta Swan Leavitt taken before 1921. Astronomy, like all sciences, is dependent on building upon our scaffolded knowledge to further our understanding into new realms of the unknown. It also depends upon teams of dedicated individuals working together. Edwin Hubble, a premiere astronomer of the early 20th century, built upon the discoveries of prior scientists and engineers. He also depended upon the support of his assistant and the staff of the Mt. Wilson Observatory, where he conducted many of his observations. Today, astronomy is increasingly relying on larger projects that require teams of men and women with diverse skill sets, including the Hubble Frontier Fields program. Frontier Fields was conceived following the successes of prior Hubble deep-field programs. These include the Hubble Deep Field, Hubble Ultra Deep Field, CANDELS, and in particular, CLASH – which helped build our understanding of gravitational lensing around galaxy clusters. The general Frontier Fields program also both benefited from, and enhanced, our understanding of mathematical models that predict how light from distant galaxies will be lensed by foreground massive clusters. Of course, all of the deep-field studies are possible because of the work of prior luminaries such as Edwin Hubble, Henrietta Leavitt, and Albert Einstein. In July 2016, the Hubble Frontier Fields team was given the AURA team award. AURA – the Association of Universities for Research in Astronomy – operates the Space Telescope Science Institute (STScI – the science operations center for Hubble) for NASA. The full list of recipients of the AURA award can be found by clicking the link below. Some of the recipients of the 2016 AURA team award. The team received the award in July 2016 for the Hubble Frontier Fields program, which began in 2013. Credit: P. Jeffries/STScI. In addition to the awardees, there is also support from the STScI directorate (Ken Sembach and Neill Reid). It should be noted that the NASA Frontier Fields program is bigger than just the core Hubble Frontier Fields program at STScI. There are also teams of people working with NASA’s other Great Observatories, the Chandra X-ray Observatory and the Spitzer Space Telescope, to acquire images of these fields in invisible X-ray and infrared light. There are teams of astronomers proposing for follow-up observations of the Frontier Fields using many ground-based observatories in radio, millimeter, infrared, and visible light. In addition, there are the astronomers and mathematical modelers who are taking this publicly available data and using it to broaden our understanding of the physics of the cosmos. Science truly is a team sport. NASA’s Frontier Fields is a program to capture new deep-field images across the electromagnetic spectrum, from X-rays to infrared light. NASA’s Great Observatories — the Hubble Space Telescope, Chandra X-ray Observatory, and Spitzer Space Telescope — are taking the lead on this ambitious effort. Other observatories around the world, including the Jansky Very Large Array (JVLA) in New Mexico, which observes radio light, also contribute considerable time to observing the new deep fields. A new Frontier Fields release from the Chandra X-ray Center highlights the energetic chaos that occurs when massive galaxy clusters collide. The two new images combine data from the Chandra X-ray Observatory, the Hubble Space Telescope, and the JVLA radio dishes. Astronomers are interested in understanding how merging galaxy clusters grow with time and what happens to the galaxies, their gas, and the associated, enigmatic dark matter. The images of these galaxy clusters (MACS J0416 and MACS J0717) are described below. Read the full release from the Chandra X-ray Center here. The galaxy cluster MACS J0416 seen in X-rays (blue), visible light (red, green, and blue), and radio light (pink), taken by the Chandra X-ray Observatory, Hubble Space Telescope, and Jansky Very Large Array, respectively. Credit: X-ray: NASA/CXC/SAO/G. Ogrean et al. ; Optical: NASA/STScI; Radio: NRAO/AUI/NSF. The object known as MACS J0416 is actually composed of two clusters of galaxies that will eventually merge to create a single larger massive galaxy cluster. The image of MACS J0416 contains Chandra X-ray data (blue), Hubble Space Telescope data (red, green, and blue), and a halo of radio light imaged by the JVLA (pink). According to a paper published in The Astrophysical Journal, the cores of the two galaxy clusters have likely not passed through each other yet, indicating an early phase of their merger. Astronomers discovered this by studying the cluster’s appearance in visible and X-ray light. 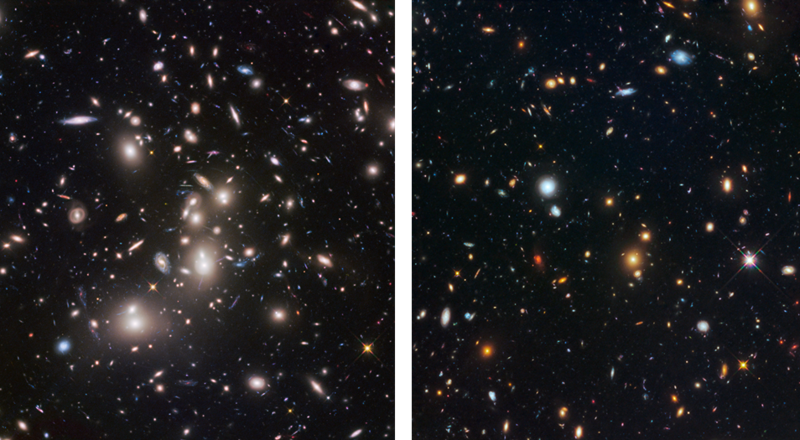 Hubble’s visible-light images show both the galaxies themselves and their gravitational lensing effects, helping us pinpoint the location of dark matter in the cluster. 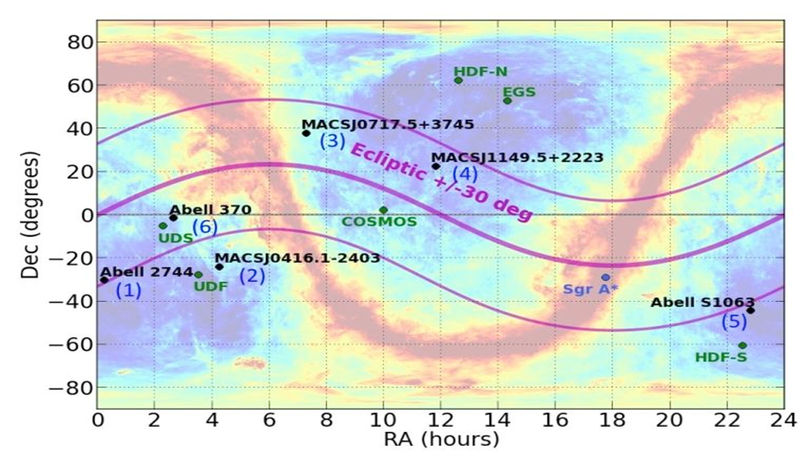 X-ray observations from Chandra show us the location of the heated gas. In MACS J0416, the galaxies and their dark matter are still lined up with the heated gas, meaning their merger has not progressed very far yet. In other observations of merging galaxy clusters, such as the Bullet Cluster, gas heated by the shock of collision eventually separates from the dark matter. The galaxy cluster MACS J0717 seen in X-rays (blue), visible light (red, green, and blue), and radio light (pink), taken by the Chandra X-ray Observatory, Hubble Space Telescope, and Jansky Very Large Array, respectively. Credit: X-ray: NASA/CXC/SAO/G. Ogrean et al. ; Optical: NASA/STScI; Radio: NRAO/AUI/NSF. The massive galaxy cluster MACS J0717 results from a merger of four clusters of galaxies. The image of MACS J0717 contains Chandra X-ray data (blue), Hubble Space Telescope data (red, green, and blue), and JVLA radio data (pink). Unlike MACS J0416, MACS J0717 appears to have been merging for quite some time. The evidence of merging includes the separated knots of X-rays (blue) formed by the collision of high concentrations of gas, and the giant arcs of radio emission (pink) stretched and distorted by the merger. MACS J0717 is also the largest known cosmic lens, and thus a prime candidate for observing distant objects magnified by gravitational lensing. The galaxy clusters in MACS J0717 are still merging and are not yet confined to a smaller area — leaving a large total mass over a relatively large area of the sky. This large gravitational lens can magnify and uncover galaxies of the early universe, a key goal of the Frontier Fields project. Often, observations of these distant, young galaxies only capture the brightest objects. But observations of MACS J0717 demonstrate how Frontier Fields can be used to view some of the universe’s more ordinary early galaxies. In a paper published in The Astrophysical Journal, astronomers discovered seven gravitationally lensed radio sources in MACS J0717. 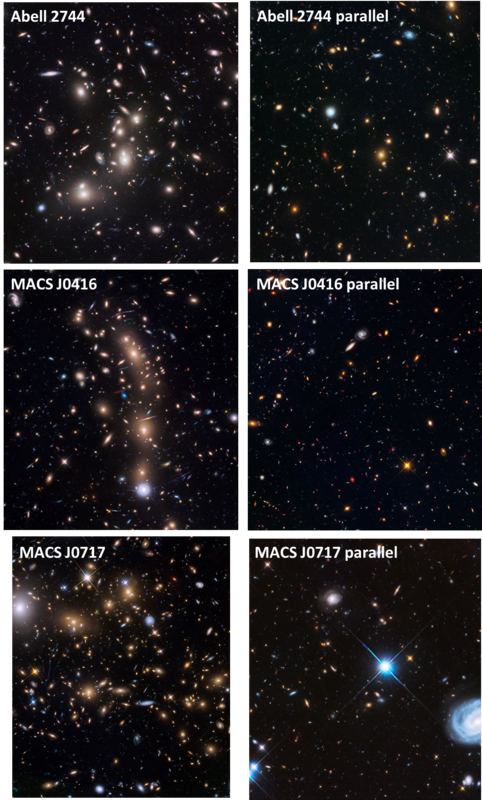 Many of these galaxies would not be observable without the benefit of magnification due to gravitational lensing. The gravitational lensing of massive clusters in radio waves provides a new view of these radio sources, which are thought to be common — but not well-studied — star-forming galaxies in the early universe. Hubble has also observed distant galaxies using gravitational lensing. An example is noted here. By using a combination of telescopes, and a combination of different wavelength observations, the Frontier Fields project is providing a broader and deeper view into the galaxies of the early universe. 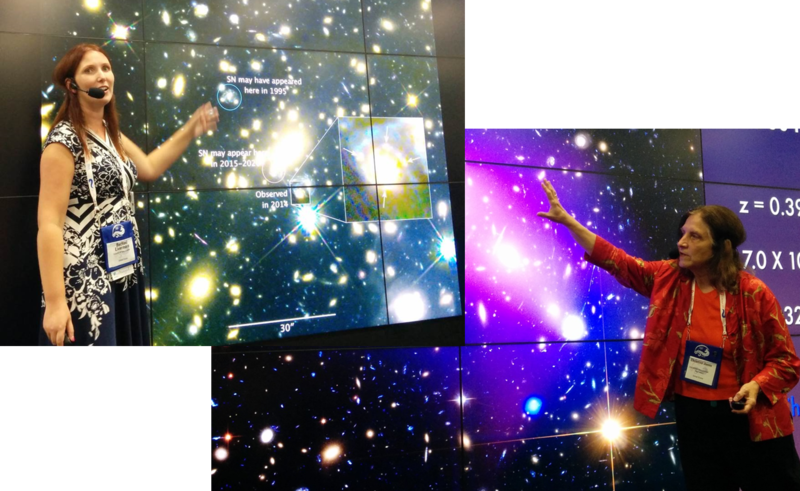 On November 3, 2015, I gave a presentation called “Hubble’s Views of the Deep Universe”. This presentation was to commemorate some of Hubble’s most influential observing campaigns during this 25th anniversary year. Of course, I could not get to all of Hubble’s programs that observed the deep universe in just an hour. For additional information, check out the science articles on the Hubble 25th website and, of course, keep checking back to this blog. For two decades, the Hubble Space Telescope has pioneered the exploration of the distant universe with images known as the “deep fields”. These deep fields have given astronomers unprecedented access to understanding how galaxies form and develop over billions of years in the history of our universe, from shortly after the Big Bang to today. Join us for a retrospective view of Hubble’s contributions to the investigation of the deep reaches of the cosmos and some fresh glimpses of what Hubble is currently doing to further our understanding of the most distant parts of the universe. Sometimes in astronomy, never-before-seen phenomena are predicted years before they are observed. Using Hubble to observe one of the Frontier Fields, astronomers spotted such an event in November 2014. Light from a distant, dying, massive star, known as a supernova, was observed in four locations on the sky due to the light-bending effects of gravitational lensing. This is just over 50 years after a Norwegian astronomer, Sjur Refsdal, predicted this phenomenon in 1964. To honor this pioneering astronomer’s prediction, the supernova has been named supernova Refsdal. The Hubble image of the galaxy cluster MACS J1149 in visible and infrared light. The distant spiral galaxy is lensed multiple times by the collective mass of the galaxy cluster MACS J1149, but a small part of it — namely the spiral arm in the distant spiral galaxy where the supernova exploded [inset image] — is also locally lensed four times by a single elliptical galaxy in the cluster. The supernova, highlighted by arrows, is observed in four locations on the sky. Credit: NASA, ESA, and S. Rodney (JHU) and the FrontierSN team; T. Treu (UCLA), P. Kelly (UC Berkeley) and the GLASS team; J. Lotz (STScI) and the Frontier Fields team; M. Postman (STScI) and the CLASH team; and Z. Levay (STScI). After the light left the distant supernova, it traversed the cosmos until it reached the gravitational influence of the massive galaxy cluster MACS J1149. The extreme mass of MACS J1149, most of which is in the form of invisible dark matter, curves or bends space. Light generally follows a straight line, but in the presence of curved space light will follow the curvature. Much like the way a glass lens redirects and amplifies light, gravitational lensing from the curvature of space also redirects and amplifies the light from distant objects. We observe the four images of the same supernova on different parts of the sky because the light from that supernova took slightly varying paths to reach us. Some of the light from the supernova was originally traveling in directions that would never reach Hubble’s mirror, but the curvature of space redirected those light paths towards the telescope. But wait, it gets even stranger! The light from the distant supernova is traversing various paths through the curved space of MACS J1149. Those paths have slightly different lengths. The light from the four observed images of the same supernova traveled for about 9.3 billion years, only to arrive at Hubble’s mirror a mere days or weeks apart. That is not all. The four observed images of the supernova appear on just one of multiple gravitationally lensed images of the background host spiral galaxy. That particular image of the distant spiral galaxy happens to fall directly behind an elliptical galaxy that is a member of the MACS J1149 galaxy cluster (the yellow-white elliptical shape in the center of the inset image above). The elliptical galaxy further lenses the supernova into the four versions we observe. This is a commonly observed effect of gravitational lensing that depends on the observer’s view of the gravitationally lensed light, and is often referred to as an Einstein Cross. But there are additional lensed versions of the distant host spiral galaxy in the image. Did we observe the same supernova in those other lensed versions of the host galaxy? Astronomers believe we may have missed the supernova from one of the lensed versions of the host galaxy by about 20 years. Due to the curvature of space, its path was slightly shorter. However, they expect that we should observe the supernova in another lensed version of the host spiral galaxy some time within the next five years. The image and accompanying video, below, highlight the varying light travel times of supernova Refsdal. Shown here is the combined visible and infrared view of the galaxy cluster MACS J1149. In this Hubble image, the lensed images of the background spiral galaxy are highlighted. The expected arrival times of the light from the supernova are also shown. The video above illustrates the varying light-travel times of the distant supernova as the light traverses around the lumpy space within the galaxy cluster MACS J1149. Credit: NASA, ESA, Ann Field and G. Bacon (STScI). These observations are not just a validation of some obscure prediction in the scientific literature. Computer models of the mass distribution of MACS J1149, particularly the mass in the form of dark matter, are providing the estimated arrival times of the various supernova light paths. Further study and analysis of the supernova Refsdal light paths will allow for the improvement of those models and a better understanding of the distribution of dark matter throughout MACS J1149. In addition to a better understanding of how dark matter is distributed in galaxy clusters, these results will provide astronomers studying this Frontier Field with a better tool to confirm the distances to far-away lensed galaxies. This is a fortuitous time in astronomy and for the Hubble Space Telescope. The paper describing supernova Refsdal, led by Dr. Patrick Kelly of the University of California, Berkeley, is being released this month in a special issue of the journal Science. This special issue of Science is commemorating the 100th anniversary of Albert Einstein’s Theory of General Relativity — the very theory that led to the prediction that distant supernovae could be gravitationally lensed by foreground galaxies or galaxy clusters. In addition to this confluence of events, it is also Hubble’s 25th anniversary. It is not lost on astronomers that it took many years and many people, including the brave astronauts of five servicing missions, to repair Hubble and upgrade Hubble’s instruments in order for such a discovery to take place. The new technology on Hubble is truly enabling ground-breaking science to this day. Dr. Lawton would like to thank Dr. Patrick Kelly (University of California, Berkeley) and Dr. Steve Rodney (Johns Hopkins University) for help in creating the content for this post. 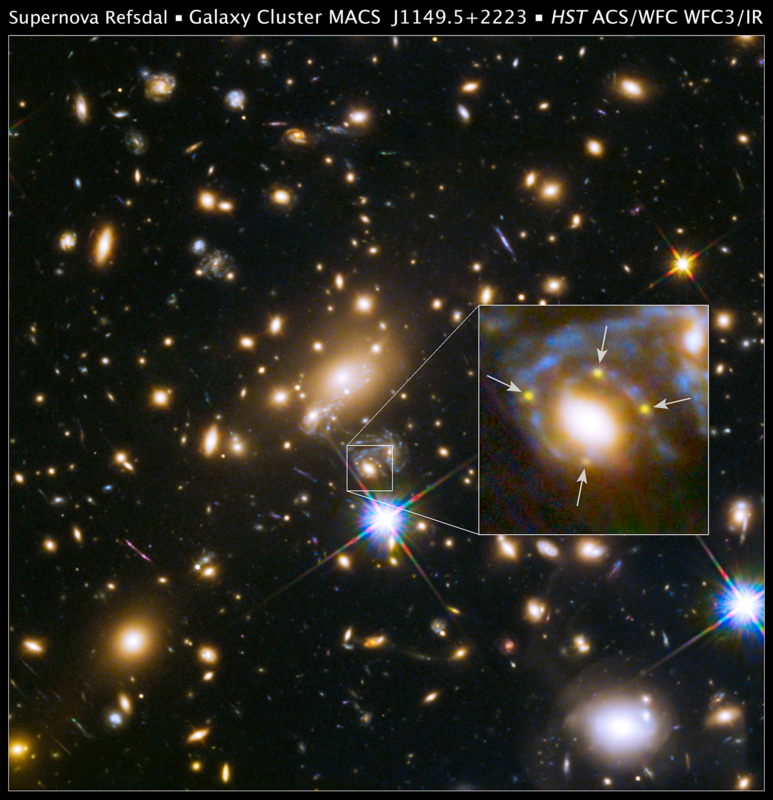 Supernova Refsdal was discovered using data from the Grism Lens Amplified Survey from Space (GLASS) Hubble program. Follow-up Hubble observations from the Frontier supernova (FrontierSN) team confirmed that the light observed was from a supernova. You can learn more about this amazing discovery on the recent Hubble Hangout. The first Hubble Frontier Fields observations of a galaxy cluster and adjacent parallel field are complete, and interesting results are starting to arrive from astronomers. In this post, we explore how astronomers used the tools available to them to piece together the discovery of a very distant galaxy. A team of international astronomers, led by Adi Zitrin of the California Institute of Technology in Pasadena, Calif., have discovered a very distant galaxy observed to be multiply lensed by the foreground Abell 2744 galaxy cluster. The light from this distant galaxy was distorted into three images and magnified via gravitational lensing of Abell 2744. This magnification provided the astronomers with a means to detect the incredibly faint galaxy with Hubble. Astronomers are interested in finding these very distant galaxies because they represent an early stage of galaxy formation that occurred just after the Big Bang. Light from this galaxy has been traveling for quite some time. We are seeing this galaxy as it existed when the universe was only about 500 million years old. For context, the current age of the universe is around 13.8 billion years old. Like visitors to a nursery, astronomers can see this baby galaxy is much smaller than present-day adult galaxies. In fact, they measure it to be about 500 times smaller than our own Milky Way galaxy. This baby galaxy is estimated to be forming new stars at a rate of one star every three years. That is about 1/3 the current rate of star formation of our own Milky Way, but keep in mind that this infant galaxy is much smaller than the present-day Milky Way. This baby galaxy is not just small but also a lightweight. It has the mass, in stars, of only about 40 million suns. Compare that to the Milky Way, which has a mass of several hundred billion suns. It is also one of the intrinsically faintest distant galaxies ever discovered. The three lensed images of the baby galaxy are highlighted in the composite image below. Credit: NASA, ESA, A. Zitrin (California Institute of Technology, Pasadena), and J. Lotz, M. Mountain, A. Koekemoer, and the HFF Team (Space Telescope Science Institute, Baltimore, Md.) 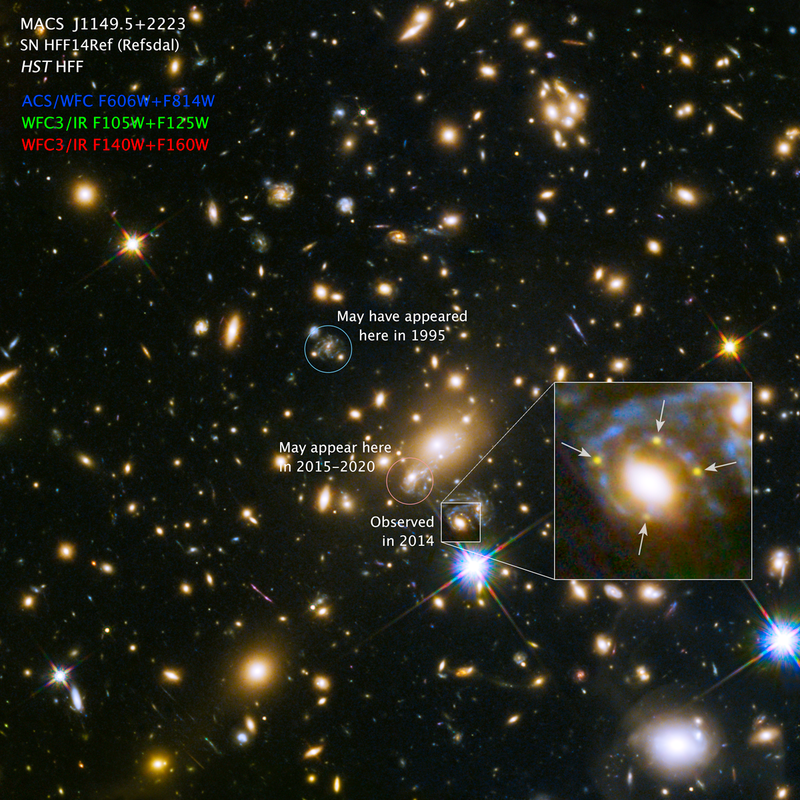 Shown is the discovery of a very distant galaxy, triply lensed by the foreground galaxy cluster Abell 2744. The distant galaxy’s lensed images are labeled as a, b, and c.
This is now one of only a small handful — about 10 — of galaxies we have discovered at such great distances. The way the team discovered this distant galaxy is, perhaps, as interesting as the galaxy itself. The team of astronomers used a traditional color-based method for determining that the galaxy is a candidate for being a distant, baby galaxy. They then followed up with a pioneering new technique to confirm the distance via the geometry of gravitational lensing. Why do we think that the galaxy is very far away? Astronomers used Hubble’s filters to capture the light from this baby galaxy in several different colors. The intensity of light coming from the galaxy at different colors can give an estimate of the galaxy’s cosmological redshift. Cosmological redshift, commonly denoted by the letter “z,” is a number that signifies how reddened a galaxy is due to the expansion of space. A distance can be estimated once a cosmological redshift is measured. Larger cosmological redshifts correspond to larger distances. Adi Zitrin and his collaborators initially found the distant galaxy (labeled “a” in the figure above) by noticing that it remained when they were looking for only the reddest galaxies. Remember, a galaxy may appear red if its light is redshifted due to the expansion of the universe. The farther the galaxy, the longer its light has to traverse the expanding universe, getting more and more stretched (redshifted) along the way. Astronomers are particularly interested in finding a population of galaxies with large cosmological redshifts — values of z around 10 or greater — because they represent some of the earliest galaxies to form after the Big Bang. From the colors of the galaxy found in box ‘a,’ the team estimated that the galaxy has a redshift greater than 4, with 95% confidence. In fact, the colors of the galaxy in box ‘a’ highly favored a galaxy around z=10, but they could not discount that what they were measuring was an intrinsically red galaxy at a lower redshift, around a z=2. How do we sort this out? Astronomers can do better, and these astronomers have shown that with knowledge of how mass is distributed in the foreground galaxy cluster, it is possible to distinguish between higher redshift and lower redshift background galaxies. Thus, with updated maps of the mass distribution of the Abell 2744 galaxy cluster, astronomers created more precise mathematical models of how light from a more distant galaxy behaves as it passes around the galaxy cluster’s warped space. The geometry of a gravitational lens is such that the more distant a background galaxy behind the galaxy cluster, the farther from the center of the galaxy cluster we observe the distorted and magnified, lensed versions of the galaxy. This is portrayed in the graphic below, where two lensed versions of the more distant, highly redshifted, red galaxy appears on the sky at larger apparent distances from the central, foreground, lensing galaxy cluster. Credit: Dan Coe (STScI). Shown here is an illustration of how the multiple lensing of a background galaxy will show its maximum magnification depending on its distance to the foreground galaxy cluster. More distant galaxies will be lensed such that we observe them farther from the center of the galaxy cluster. 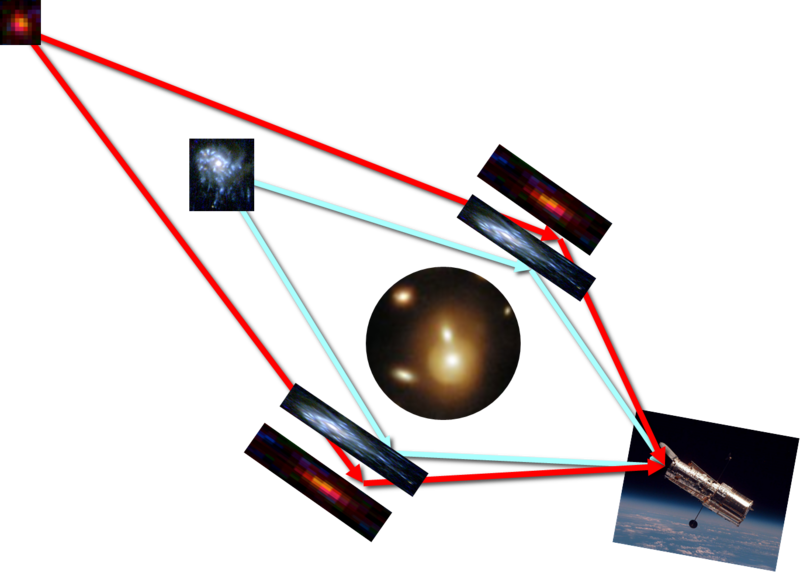 Astronomers can use the computed geometry of gravitational lensing to ascertain the cosmological redshift of the lensed galaxy based on its observed positions relative to the foreground galaxy cluster. If multiple images of the lensed galaxy appear nearby the cluster, it is at a lower redshift. If the multiple images of the lensed galaxy appear more separated from the cluster, it is at a larger redshift. 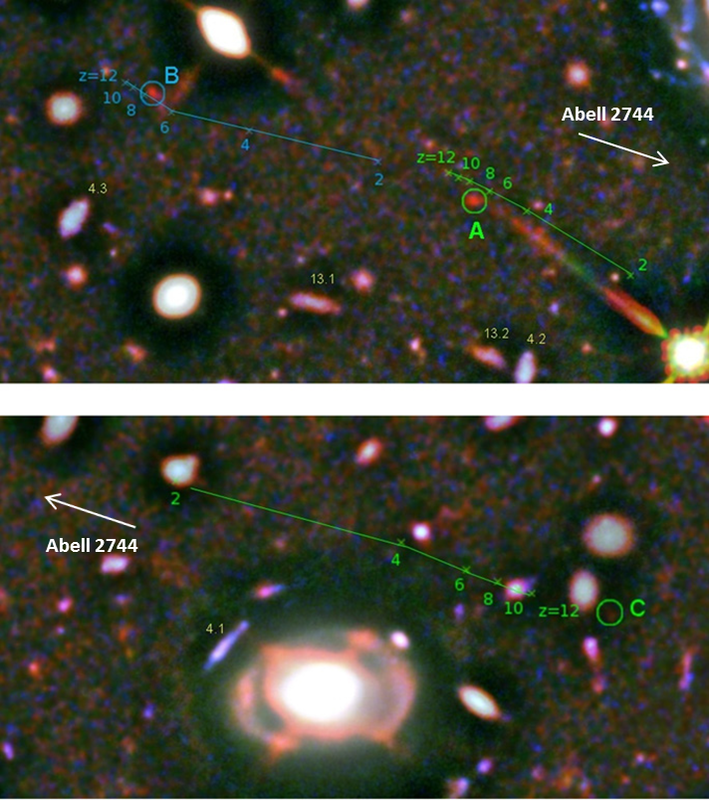 With the updated mathematical models of the gravitational lensing by Abell 2744, Adi Zitrin and his team could follow up and look for multiply lensed images of the one potentially distant galaxy they had found, labeled “a” in the image at top. The mathematical models give them positions on the sky to look for the lensed siblings of galaxy ‘a’ for various redshifts. If the distant galaxy is at a relatively low redshift, multiply lensed images will appear nearer the cluster. If the distant galaxy is at a high redshift, multiply lensed images will appear farther from the cluster. With the computational tools and mathematical knowledge available to them, the team discovered the lensed versions of galaxy “a” at positions that match a high-redshift solution. In the figure below, they marked the locations of the lensed images, labeled “B” and “C”, along with their best mathematical estimates of redshift for each of them (labeled along the blue- and green-colored redshift lines). What is labeled as the initially discovered candidate galaxy “a” in the image at top is now labeled as “A” in the image below. Credit: Modified from Adi Zitrin et al., ApJ, 793 (2014). Shown here are the expected positions of the three lensed versions of the newly discovered high-redshift galaxy candidate, based on mathematical models of the gravitational lensing from Abell 2744. The multiply-lensed positions of the galaxy, labeled “A”, “B”, and “C,” match the high-redshift solution in the models, i.e., redshifts of around 8 or greater. This is but a taste of how astronomers will use the Frontier Fields to combine exquisite imaging with updated mathematical models to detect and study some of the first galaxies to form after the Big Bang. We are just at the beginning of collecting the baby pictures of galaxies in our universe. Stay tuned as we detect more baby galaxies from the dawn of time! The galaxy presented here is one of the least luminous high-redshift galaxies ever detected. This bodes very well for finding future baby galaxies in the Frontier Fields. We also expect that studies of the galaxy clusters themselves, via the new data in the Frontier Fields, will lead to more accurate mass distribution maps and more accurate mathematical models of how light from distant galaxies are gravitationally lensed and magnified. This really is a new age in using humankind’s most sophisticated telescopes with nature’s lenses to probe deeper into our cosmic past than ever before. Stay tuned for more results from the Frontier Fields. You can watch a Hubble Hangout of this result here! How Were the Galaxy Clusters Chosen? The 12 Frontier Fields will greatly expand upon our knowledge of the earliest galaxies to form in the universe. These images of the distant universe (in space and time), will provide us with a sneak peek at the first billion years of the universe. So how were these fields chosen? The Frontier Fields program was sketched out by the Frontier Fields team in the earliest phases of a recommendation process. Much can change in the process of going from an initial recommendation to a final program. The final program hinged upon finding the best galaxy clusters to anchor the Frontier Fields program. Team members deliberated between several different galaxy clusters, nominated by both those directly involved in the program and the broader astronomical community, before settling on the final candidates. were observable by ground-based observatories in the Northern and Southern hemispheres. The Frontier Fields team, with input from the broader astronomical community, was able to narrow down the galaxy cluster candidates to the six chosen for the program. Although it was not possible to select six clusters that met all of the criteria, most of the clusters satisfied most of the criteria. Let us explore the three criteria in a little bit more depth. Astronomers focused on massive galaxy clusters as candidates because the gravitational lenses they create are likely to provide the greatest magnification of background galaxies, but there were other considerations as well. 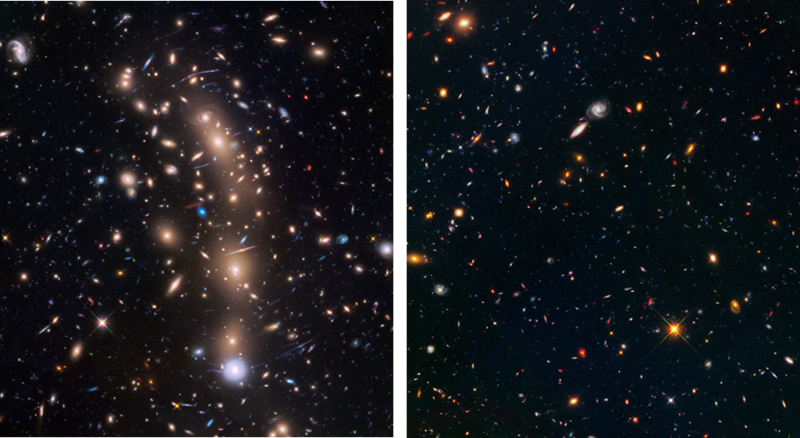 Hubble is observing the Frontier Fields with a visible-light instrument and an infrared-light instrument. The fields of view of these instruments, defined to be the area of the sky they can image in one pointing, are relatively small – a box with sides about 1/15 the width of the full moon. Because of the small fields of view, the galaxy clusters need to be relatively compact so that any magnified background galaxy remains within the fields of view. There is another reason why the galaxy clusters must be relatively compact in size. For each of the galaxy clusters, Hubble is also imaging an adjacent parallel field. For the goals of the program, the parallel fields need to contain unobstructed views of the early universe, devoid of the metropolis of galaxies that make up the galaxy clusters. Astronomers lose the magnifying power of the galaxy clusters, but gain simplicity. For the parallel fields, astronomers do not require detailed models of how the light from the distant galaxies are lensed by the foreground clusters. Below is a map of the sky showing the locations of the six pointings required for Hubble to acquire the 12 Frontier Fields, labeled in order of when Hubble plans to observe them. The green labels are previous deep-field programs. The map is in right ascension and declination coordinates. For a map of the Frontier Fields on the sky, with respect to the constellations, see this previous post. Note: The right ascension of the map in the previous post is flipped with respect to the map below in order to portray the constellations as they appear to us on Earth. This map shows the locations of the Frontier Fields on the sky using right ascension and declination coordinates. The Frontier Fields are numbered in the order of their observations. The colors denote the amount of extinction, or dimming, of light from distant galaxies due to foreground dust. Dark red denotes the greatest dust extinction. Dark blue denotes the least dust extinction. The wavy dust band across the sky is our Milky Way galaxy. The thick purple line is the ecliptic, which is the plane of our solar system. The two thinner parallel purple lines mark 30 degrees north and 30 degrees south of the ecliptic. Previous deep-field programs are labeled on the map in green: HDF-N (Hubble Deep Field North), HDF-S (Hubble Deep Field South), UDF (Ultra Deep Field), UDS (Ultra Deep Survey), COSMOS (the Cosmic Evolution Survey), and EGS (the Extended Groth Strip). Sgr A* denotes the position of the center of our Milky Way galaxy. The two main features to note on the above map are the colors that signify dust that can lessen the light from distant galaxies reaching Hubble’s mirror and the thick purple line that marks the plane of our solar system, known as the ecliptic. The locations of the Frontier Fields’ galaxy clusters were chosen to be in relatively “clean” parts of the sky. By that we mean that the galaxy clusters are not located where there is a large quantity of foreground dust. The galaxy clusters in the Frontier Fields were chosen to avoid areas of greatest dust extinction. Dust extinction is the scattering or absorption of light by dust. It is problematic because it lessens the light we receive from distant objects. On the above map, dark red denotes areas of greatest dust extinction. Dark blue denotes little dust extinction. The red, high-extinction band in the all-sky map is due to the dusty disk of our own Milky Way galaxy. It appears wavy due to the projection of the sky onto the right ascension and declination coordinate system. The thick purple line denotes the plane of our solar system, called the ecliptic. Dust within our solar system is clustered around the ecliptic. This dust scatters the light from our Sun and produces a bright haze. It can be very difficult to observe faint objects through the zodiacal light. For this reason, the galaxy clusters were chosen to avoid the ecliptic. Much of what we learn from the Frontier Fields will come from follow-up observations using ground-based telescopes. Most of the galaxy clusters in the Frontier Fields are observable by state-of-the-art astronomical telescopes in both the Northern and Southern hemispheres. These include the new radio telescope in Chile, named ALMA, and the suite of telescopes on Mauna Kea in Hawaii. For more info, the Frontier Fields galaxy cluster selection was also recently described in a Google+ Hubble Hangout.